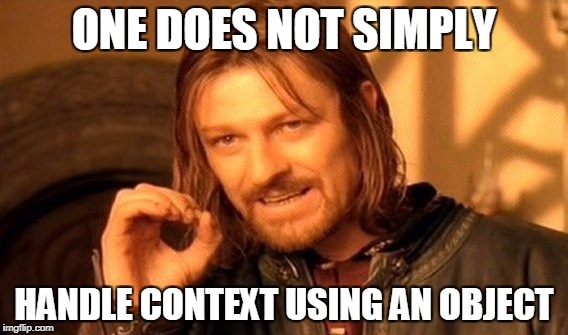 Proper context handling is essential when working with Akka actors. Let's see the Cameo design pattern in action and see how it solves some complex problems. Rarely during my life as a developer have I found pre-packaged solutions that fit my problem perfectly. Design patterns are an abstraction of both problems and solutions. So, they often need some kind of customization on the specific problem. While I was developing my concrete instance of the Actorbase specification, I came across the Cameo pattern. It enlighted my way and my vision about how to use Actors profitably. Let’s see how and why. One of the most difficult tasks in asynchronous programming is trying to capture context so that the state of the world at the time the task was started can be accurately represented at the time the task finishes. This is exactly the problem we are going to try to resolve. Actors often model long-lived asynchronous processes in which a response in the future corresponds to one or more messages sent earlier. Meanwhile, the context of execution of the Actor could be changed. In the case of an Actor, its context is represented by all the mutable variables owned by the Actor itself. A notable example is the sender variable that stores the sender of the current message being processed by an Actor. Let’s make a concrete example. In Actorbase, there are two types of Actors among the others: StoreFinder and Storekeeper. Each Actor of type StoreFinder represents a distributed map or a collection, but it does not physically store the key-value couples. This information is stored by Storekeeper Actors. So, each StoreFinder owns a distributed set of its key-value couples, which means that owns a set of Storekeeper Actors that stores the information for it. StoreFinder can route many types of messages to its Storekeeper, representing CRUD operations on the data stored. The problem here is that if a StoreFinder owns n Storekeepers, to find which value corresponds to a key (if any), it has to send n messages of type Get("key") to each Storekeeper. 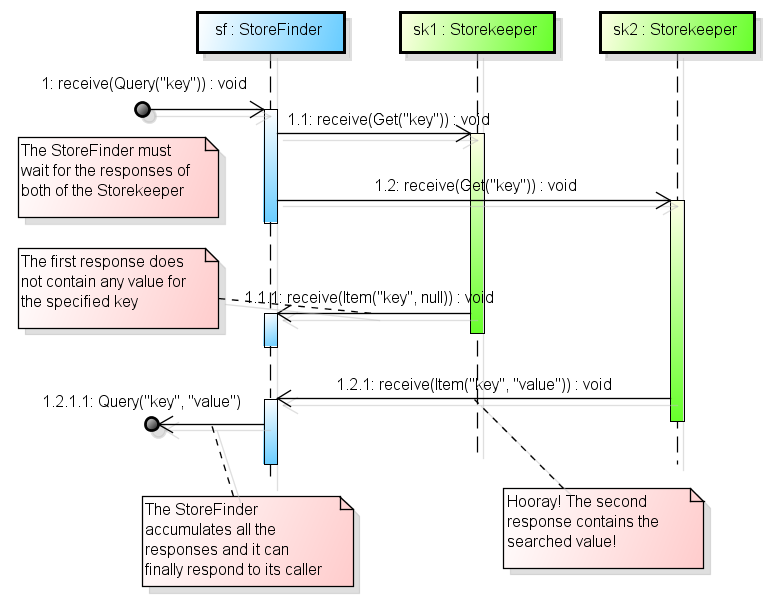 Once all the Storekeepers answer the query messages, the StoreFinder can answer to its caller with the requested value. The sequence diagram below depicts exactly the above scenario. The number of answers of Storekeeper Actors and the body of their responses represent the execution context of a StoreFinder Actor. So, we need to identify a concrete method to handle the execution context of an Actor. The problem is that between the sending of a message and the time when the relative response is received, an Actor processes many other messages. Using nothing more than my ignorance, the first solution I depicted in Actorbase was the following. // Such a complex data structure! As you can imagine, the handling process of this context is not simple, as a single StoreFinder has to handle all the messages that have not received a final response from all the relative Storekeeper. We can do much better, trust me. A first attempt to reach a more elegant and concise solution might be the use of the Ask pattern with Future. This is a great way to design your actors, in that they will not block waiting for responses, allowing them to handle more messages concurrently and increasing your application’s performance. Using the Ask pattern, the code that handles the Query message and its responses will reduce to the following. Whoa! This code is fairly concise with respect to the previous snippet. In addition, using Future and a syntax that is fairly declarative, we can achieve, quite easily, the right grade of asynchronous execution that we need. However, there are a couple of things about it that are not ideal. First of all, it is using futures to ask other actors for responses, which creates a new PromiseActorRef for every message sent behind the scenes. This is a waste of resources. Furthermore, there is a glaring race condition in this code — can you see it? We’re referencing the “sender” in our map operation on the result from futureQueryAck, which may not be the same ActorRef when the future completes, because the StoreFinder ActorRef may now be handling another message from a different sender at that point! The problem here is that we are attempting to take the result of the off-thread operations of retrieving data from multiple sources and return it to whoever sent the original request to the StoreFinder. But the actor will likely have move onto handling additional messages in its mailbox by the time the above futures complete. The trick is capturing the execution context of a request in a dedicated inner actor. Let’s see how our code will become. Much better. We have captured the context for a single request to StoreFinder as the context of a dedicated actor. The original sender of the StoreFinder Actor was captured by the constant originalSender and shared with the anonymous Actor using a closure. It’s easy, isn’t it? This simple trick is known as the Extra pattern. However, we are searching for a Cameo in our movie. The Extra pattern is very useful when the code inside the anonymous Actor is very small and trivial. Otherwise, it pollutes the main Actor with details that do not belong to its responsibility (one for all, Actor creation). It is also similar to lambdas, in that using an anonymous instance gives you less information in stack traces on the JVM, is harder to use with a debugging tool, and is easier to close over state. Luckily, the solution is quite easy. We can move the anonymous implementation of the Actor into its own type definition. This results in a type only used for simple interactions between actors, similar to a cameo role in the movies. Doing so, the code finally becomes the following. Notice that the router in the StoreFinder tells the routees to answer to the actor that handles the query messages, broadcastRouter.route(Get(key, u), handler). Moreover, remember to capture the sender in a local variable in the main actor before passing its reference to the inner actor. Make certain you follow that pattern, since passing the sender ActorRef without first capturing it will expose your handler to the same problem that we saw earlier, where the sender ActorRef changed. So far so good. 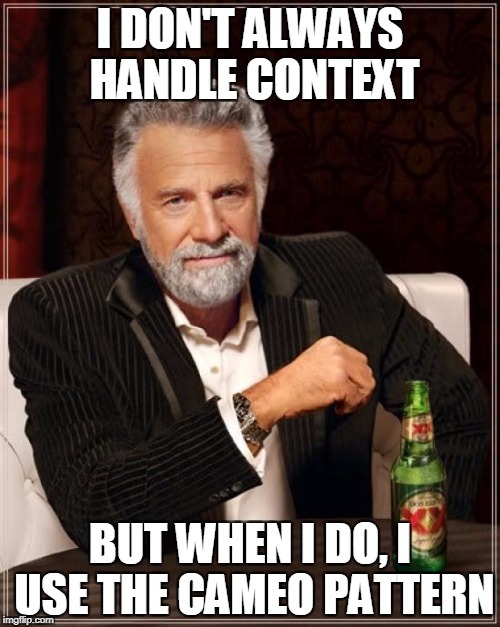 We started by stating that context handling is not so trivial when we talk about Akka Actors. I showed you my first solution to such a problem in Actorbase, the database based on the Actor model I am developing. We agreed that we do not like it. So, we moved on and we tried to use Futures. The solution was elegant but suffered from race conditions. In the path through the last solution, we met the Extra pattern, which solved the original problem without any potential drawback. The only problem is that this solution was not clean enough. 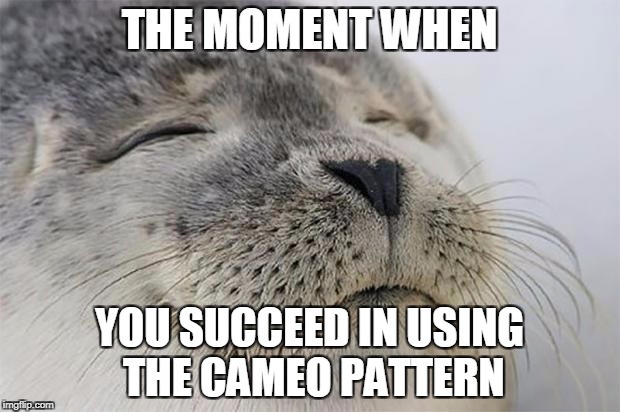 Finally, we approached the Cameo pattern, and it shined in all its beauty. Simple, clean, elegant. P.S. : All the code relative to Actorbase can be found on my GitHub.